Moxy Maxwell had a great Christmas. She got lots of nice gifts and soon she and her brother Mark are going to Hollywood to spend a whole week with their dad! Moxy and Mark haven't seen him in three years, so Moxy is understandably looking forward to it. Not to mention her plans for being "discovered" and catapulting into superstardom while she's there. There's only one problem with this plan. 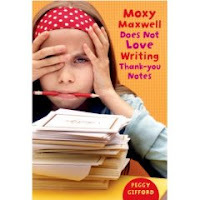 Mrs. Maxwell says that Moxy has to get her thank-you notes written before she leaves for California. Moxy has twelve thank-you notes to write. And it's not that she's not grateful. She is. It's just that it's so much work. Moxy has some ideas to make it easier. They include enlisting the help of her younger sister, using her step-dad's brand new copier (that no one is supposed to touch), and getting her hands on some gold spray paint (there are five reasons that Moxy is not allowed to touch a can of spray paint until she is twenty-one). Will Moxy get her thank-you notes written? This sequel to Moxy Maxwell Does Not Love Stuart Little goes a little deeper than the first book. We see more of Moxy and her family, including her unreliable father. As the book progresses we see that Moxy's dad has canceled on her Christmas visits the past two years. Mark is a little more realistic and tries to prepare himself for the disappointment that might come. But Moxy is totally counting on this visit, looking forward to it with all her might. And in the end we'll find that Moxy does have someone she can count on... but it might not be who she thinks. Also reviewed by Mary Lee over at A Year of Reading.